Carlo Finucci insists Fife Flyers can take confidence from their weekend in Belfast despite returning with zero points for their efforts. A double concession on a five-on-three penalty proved decisive in a 6-3 defeat on Friday, while the Kirkcaldy side were on the wrong side of a closely fought 2-1 game on Saturday. Sunday’s scheduled match against league leaders Cardiff Devils was cancelled after the team were stranded in Belfast due to ferry cancellations - possibly a “blessing in disguise”, Finucci said, as it avoided three games in three nights against the league’s top two clubs. “It was tough not to get any points from the weekend, but the way we played gave us some confidence,” he explained. “The first night we gave them three goals in five minutes and two of them were on the five-on-three powerplay. “That broke the game open for them, and although we got one late in the second to give ourselves a chance, we couldn’t get another one and they got the empty netter. “On Saturday we knew we had to be better, and I think we were. We were only able to get one behind them, and we definitely had chances to put the puck in the net. Flyers form over the past 20 games is the second worst in the EIHL, but Finucci reckons the team is capable of getting back to their early season form. “People were really excited with our start, but it’s tough to keep that going through a whole 60-game season,” he said. “We were consistently winning but if you look back we were getting outshot a lot in those games. “We’ve limited the shot count from that point in the season but the results aren’t coming our way. “It just goes to show how different things happen at different times of the year. “Back then we were very opportunistic, scoring in bunches, and although we were giving up close to 50 shots, we were coming out with wins. “I feel as a group we’ve been playing much better hockey collectively, and limiting our mistakes, and that’s all you can ask for. “Eventually with the personnel we have the goals will come. “We know we have a good goalie, and defensively, as long as we’re playing well as a group, not just the defencemen but the forwards as well, we still have 20 games to get ourselves in a good position for play-offs, and that’s what we’re going for. After dropping to fifth place and into a battle for a play-off spot, Flyers now face a crucial double-header against conference rivals Glasgow Clan this weekend, the team who took fourth place from them. “Regardless of who we’re playing this is a big weekend for us - but being against Glasgow is going to add more spice to it for sure,” Finucci said. “We’ll be ready to go. We’ll go over everything that happened over the weekend on our side, have a good look at their video, and get ourselves prepared. 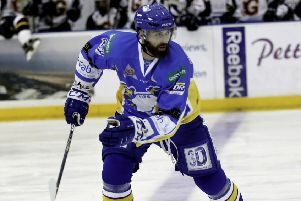 Finucci has managed 39 points from 38 appearances in the EIHL this season and he hopes to be a key contributor in the play-off push. “I might not be scoring the amount of goals I’d like to be scoring, but I’m definitely helping in the assist category and playing with some good players makes it easy. “It’s a tougher league this year playing every team six times, so to be putting up a point per game, I feel I’m doing my job in that sense.